We are reaching a crisis point here as Phillies fans. People are beginning to imagine a player, currently on another team, wearing the Phillies pinstripes in a few years. John Stolnis talked about it last week. Justin Klugh wrote at length a few weeks ago about how little the Phillies have done to recruit him. Now, it seems the thought of this player coming to the Phillies is beginning to enter an even larger audience. It began in November. Local writers, desperate for attention, began postulating that the team should always be thinking about Mike Trout when they formulate their plans going forward. That the presence of one player on the free agent should influence the decision how a 25 man roster is constructed for the next two years. Then, we started seeing it from people with a larger national audience. People are beginning to actually, firmly believe that Bryce Harper will sign with someone else and not in Philadelphia because he doesn’t always want to be compared with Mike Trout. Now, it seems that our local heroes have also become infected. Let me lay this out gently. Well no, here is a person far more qualified than me to lay it out gently. It is time for us as Phillies fans to stop living in a dream world. Mike Trout is not coming to Philadelphia. You can read all you want about how much he loves it in his hometown, how much Jim’s Lunch in Millville means to him, how he is an Eagles season ticket holder and how all of this will play into a decision he doesn’t even need to make for two more years. Sure, all of these factors could come into play when he is due to hit free agency. We’ve all seen some athlete in other sports choose their hometowns as the place they most desired to play. First, it was LeBron James, coming home to Cleveland. This past offseason in hockey, it was John Tavares going to Toronto. (DID YOU KNOW TAVARES HAD MAPLE LEAF SHEETS?!?!?!?!?!?!?!) These stick out because they were high profile athletes at the top of their profession that wanted to go back to where they grew up in order to help bring a championship to that team. This will not happen with Mike Trout. Now, I will say this. I will be the first one to eat my foot if this were to ever come to fruition. I will lead the parade down Broad Street, shouting “I WAS WRONG!” if he puts ink to paper on a Philadelphia contract. I will send this entire piece to Freezing Cold Takes on Twitter should this come around. There are a myriad of reasons why, many of which have already been dissected by minds sharper than mine, but a few of which I will lay out here. 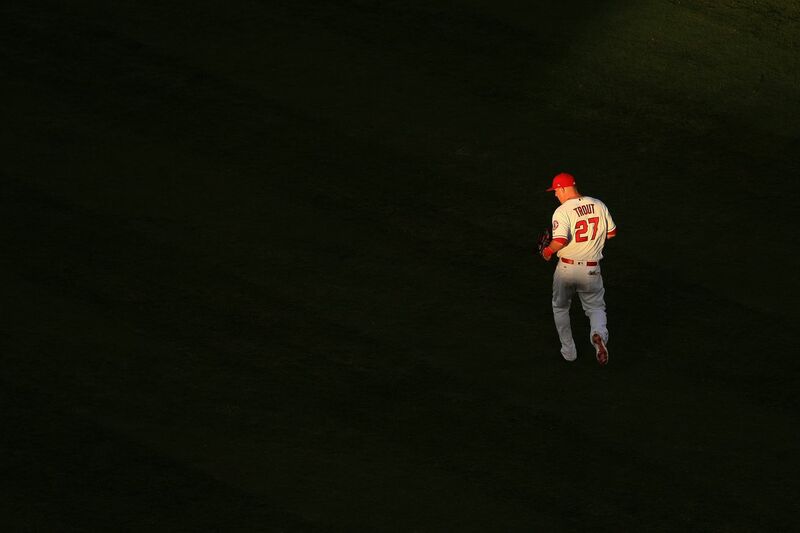 Why would the Angels let someone who could be the greatest player to ever play the game simply walk away? What makes anyone think that whatever money/years Trout would want would be out of reach of the same owner who gave Albert Pujols a ten-year contract? Why are we automatically discounting the fact that in two years, the earliest Mike Trout will be able to control his own destiny, none of the other 29 teams won’t be lining up to get him? Why do you think that Philadelphia will be the only team that can afford him, especially after we find out that baseball has a new record in revenues this past season? Why do you think that a football fandom will influence his decision? Is he having a difficult time attending games now as an Angel? We’re getting to the point where some people are actually of the belief that two free agents this season, Manny Machado and Bryce Harper, the pair of which we may never see the likes of again, should be passed on simply to save money for a player who might also scorn Philadelphia and sign somewhere else. It’s true! The Phillies have a rare opportunity RIGHT NOW to sign one of the players that, only a few years ago, were actually in the discussion of being the same caliber of player as Trout. They don’t have to wait for someone like Trout. THEY CAN SIGN SOMEONE CLOSE TO HIM RIGHT THIS SECOND! THE PHILLIES CAN SIGN MANNY MACHADO AND/OR BRYCE HARPER AND STILL HAVE MONEY LEFT OVER TO SIGN MIKE TROUT IN TWO YEARS! All of this talk is simply nonsense about waiting for Trout. Maybe it’s the stress of having to wait for the plans of MacHarper to become publicly known that is beginning to wear on people. Maybe it’s the fact that with nothing else happening in the baseball landscape, people need something to talk about, dreams to have, hopes to nurture. This idea of waiting for Trout is not one of them. So, I implore you, as a rational Phillies fan: please stop talking about Trout. It’ll make you feel better. You’ll sleep better at night. You’ll be better relaxed knowing this simple truth. He’s. Not. Coming. To. Philadelphia.